Vancouver is a bustling west coast seaport city in British Columbia. Just over an hour’s drive from the Canada-America border, it has star attractions such as the scenic Stanley Park and quirky Granville Island. 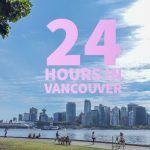 There are an overwhelming number of cheap hostels in Vancouver, including those with bars and a beach hostel. 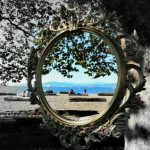 While the city can be expensive, this guide explores cheap accommodation in Vancouver so your hard earned dollars can stretch even further on your vacation. 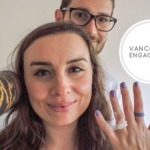 We (Gemma and Craig) love Vancouver so much that Craig proposed under the fake stars of the Macmillan Space Centre! Ps. You can secure the best places to stay in Vancouver via the ‘book me’ button with no additional fees. HI Downtown Hostel is what the young ones would call retro and old school with frilly linen and brown patterned carpets. The real appeal of this hostel is the large rooftop terrace, perfect for sunny days. The free continental breakfast goes down well too! 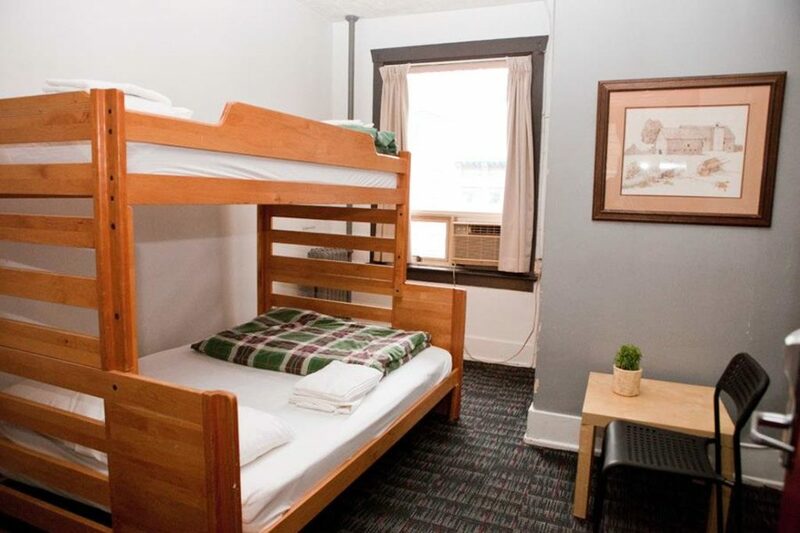 The hostel is situated in the West End, but still within walking distance to downtown attractions. Sunset Beach and Robson Street (shopping heaven!) 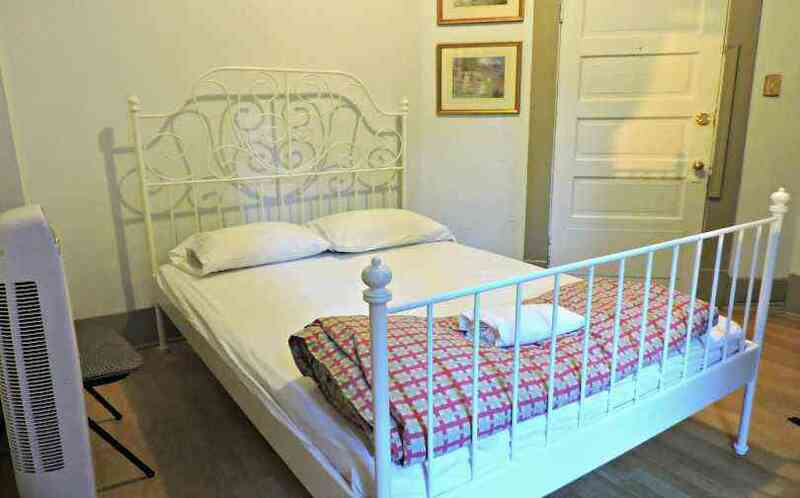 are 10 minutes walk away from the hostel. Yaletown-Roundhouse Skytrain is 0.6 miles away. The West End really is an awesome place to stay for walking and eating. There are meeting rooms, a shared kitchen, library and communal rooms in the hostel. The small shared rooms sleep up to four people. There is also private double rooms, with sinks and towels provided. Shared bathroom facilities are available and there is an ATM on-site. √ Pros: quiet location, free breakfast, wheelchair accessible. × Cons: Refreshing the decor is one suggestion from previous guests. → Best for couples and solo backpackers. » HI Vancouver Downtown Hostel address: 1114 Burnaby Street. The HI Vancouver Central hostel is right in the heart of the city’s excitement – Granville Street’s pub and club district. You will not be bored when staying here. Vancouver Central Hostel arranges daily tours to tourist attractions like Capilano Suspension Bridge, and Top 10 Vancouver Highlights Tours. Oh and you can sign up for their famous pub crawls – not for the faint-hearted. For no additional price, there is a free all-you-can-eat breakfast served every morning saving you $5 per day for more partying or exploring Vancouver. You can also relax in the lounge and TV room, with or without your hangover! 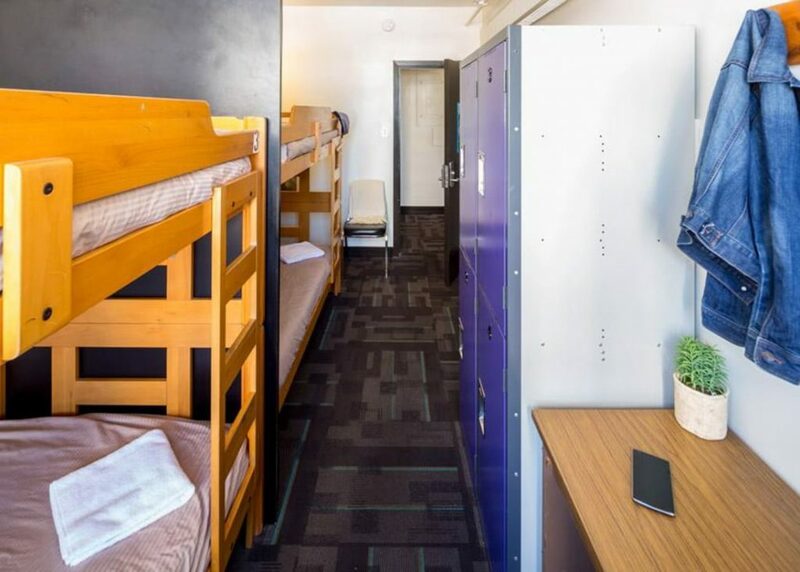 A range of dorm and private rooms are available with lockers in the rooms. There is a dining room area where you can prepare some food with kettles, refrigerators, microwaves and toasters. √ Pros: central location, ideal to meet new people. × Cons: older building, cooking facilities are limited. » HI Vancouver Central Hostel address: 1025 Granville Street. Are you a social butterfly? Are you a fan of beer pong? What about computer games? Well, the Cambie Gastown is the perfect bed for you Goldilocks! Instead of three bears (depends how the night goes…) you can get friendly with the hostel cat, Oreo. The Cambie Hostels really are known as the party hostels in Vancouver. Not a fan of cats? Let staff know before you arrive so they can book you a room on the second floor. The same advice goes if you prefer a quiet room. Cambie @ Gastown is where we experienced our first game of North American beer pong and Craig was terrible at the punchbag challenge! The next day, after the party is over you can rest in the hostel common room, dine in using the fully stocked kitchen or walk off the hangover at the closeby Vancouver highlights such as the Gastown Steam Clock or the Chinese Gardens (my fave). While visitors love the party and the location, some aren’t as impressed with the rooms. The main issue is the lack of power plugs for phone charging. Due to the hostel being in a heritage building, plugs can’t be moved closer to beds (which many backpackers now expect). battery pack like this Anker, charge the pack and then charge the phone in bed. 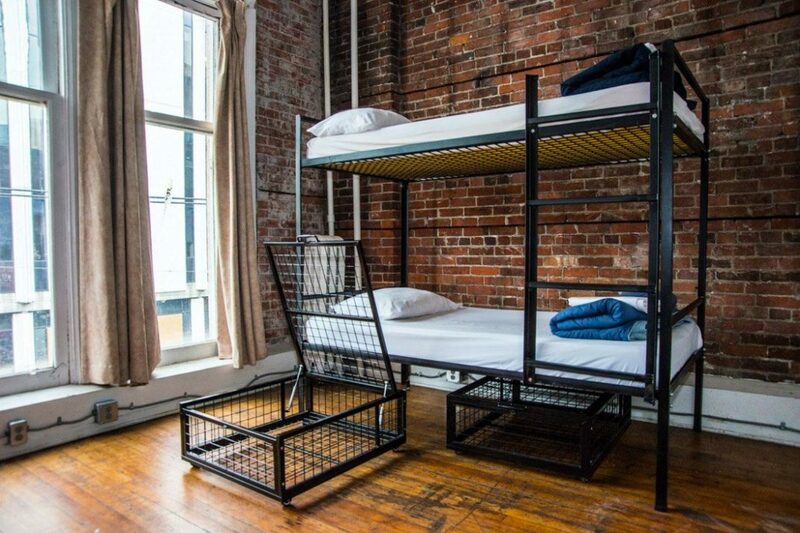 The Cambie @ Gastown has a mix of two, four and eight-bed shared rooms which come in mixed and female/male only. Rooms have lockers and towels can be hired. √ Pros: location, party hostel. × Cons: noise, lack of plugs by beds. → Best for party backpackers. » Cambie Gastown address: 310 Cambie Street. The Cambie Seymour Hostel prides itself on being one of the most popular hostels in Vancouver, providing tours and backpacking promotions at their bar and restaurant. This is definitely the hostel to meet new people and share all your Vancouver experiences. You will be central to most attractions and nightlife as the Cambie Seymour is situated one block from Granville Entertainment Strip. Like food? Check out the French-Canadian poutine from ‘Mean Poutine’ one street over – it’s awesome. This downtown location means there will be no trouble finding your way back after a long day exploring. Don’t forget to check out the Science World in Vancouver and the Omnimax Theatre is also well worth a visit. Here you can see our planet up close and personal on the largest dome screen in the world! The Cambie Hostel offers private rooms, four-bed dorms and unusually two-bed dorms for the same price as a large dorm room. Free luggage storage is available, towels and hairdryers are for hire. Linens can be changed upon request if required. The front desk is manned 24 hours a day and there is a computer station if you require internet access, cell roaming is expensive guys! There’s also an ATM on site. Craig actually lived here for two weeks when he first moved to Vancouver in his early 20s. 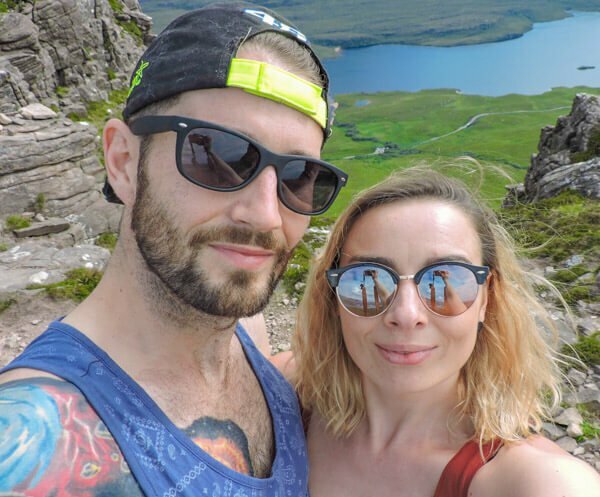 He met his (Irish) friends for life and new roommates at the hostel bar during that Vancouver initiation process. √ Pros: location, social, two-bed dorms. 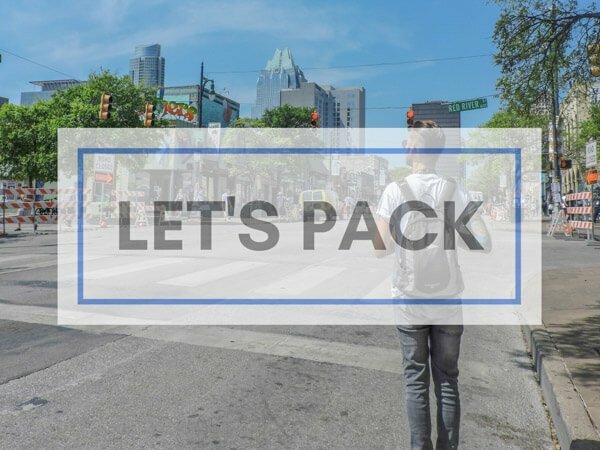 → Best for budget backpackers and visitors. » Cambie Seymour Hostel Address: 515 Seymour Street. The Samesun Hostel Vancouver is a chain of well-known hostels in North America, providing a mellow vibe in Vancouver. There is an onsite bar and restaurant, ‘The Beaver’ providing free breakfast to hostel guests. Breakfast includes muffins, bagels, fruit, eggs and cereal-perfect for setting you up for the day! The onsite bar offers fun, nightly events such as bingo, quizzes and hosts the latest sports games on TV. Located in Vancouver’s downtown, the Samesun is close to all public transport and sightseeing attractions. Granville Island and Stanley Park are within walkable distance. 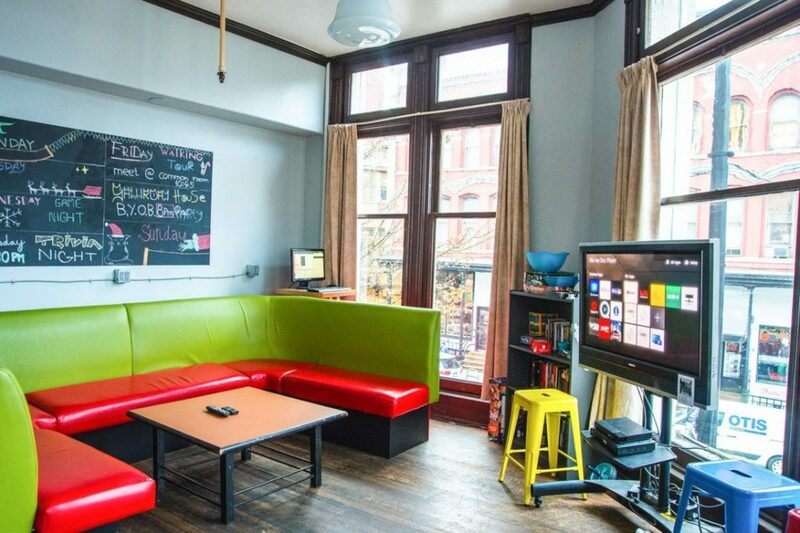 This is one hostel you need to check out! A mix of private and dorm rooms, with new ‘pod’ like beds to offer more comfort and privacy than a normal bunk bed. Private rooms include a flat-screen TV and a small refrigerator. The dorm rooms have enough lockers for each guest. Let’s not forget the newly renovated bathrooms, shared common spaces and guest kitchen. Free wifi is available. Did we mention the movie room? Yes, there is one at this hostel! √ Pros: prime location, very clean, free breakfast, friendly staff, number one on Tripadvisor for Vancouver hostels! × Cons: no elevator, no air conditioning. » Samesun Hostel address: 1018 Granville Street. This hostel is only open during the summer months and it’s a prime location for nature lovers. This stunning exterior hostel is in parkland near Kitsilano’s loveable beaches yet only a short distance by public transport to downtown Vancouver. Highlights include hikes along the nearby beach, hiring bikes and kayaks and exploring Kitsilano’s friendly community. Other sites nearby are Pacific Spirit Regional Park and Spanish Beach. 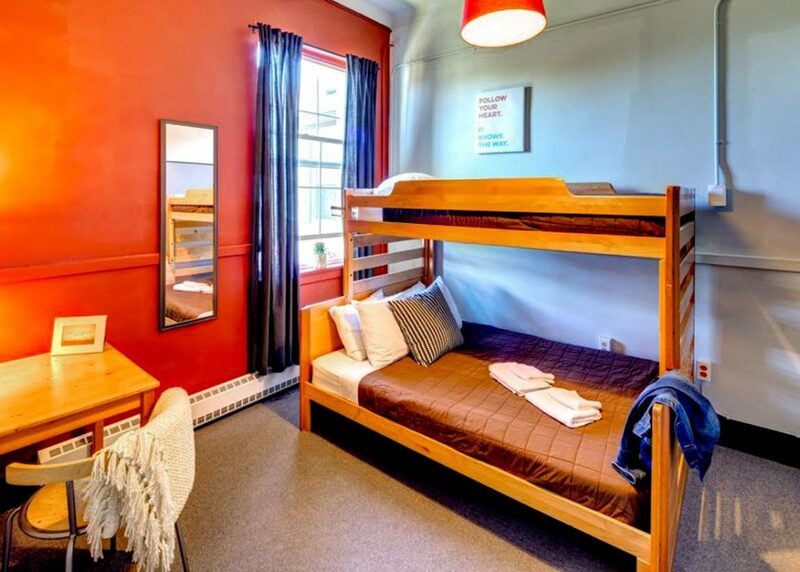 There are shared rooms, private rooms and family rooms at this hostel. The dorms have shared bathrooms while some of the private rooms have ensuites. Towels and linen are provided. There is free parking and a cafe on-site. A community dining area offers toasters, microwaves, refrigerators and kettles. 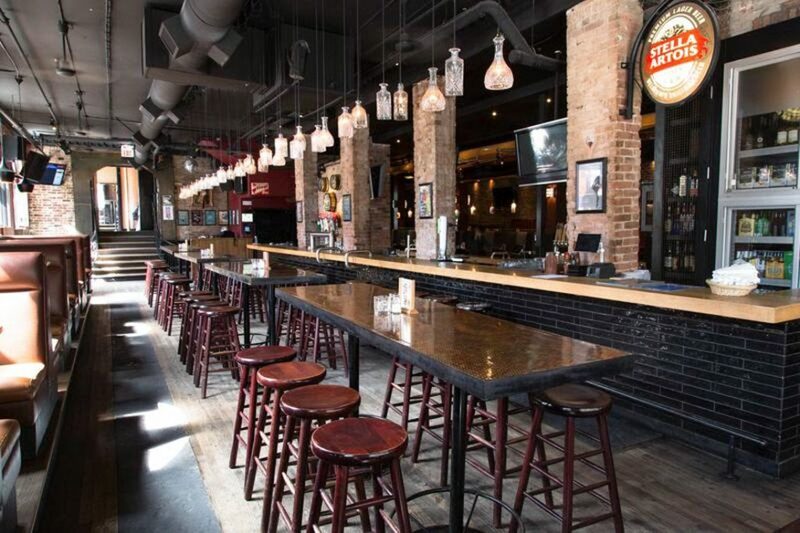 √ Pros: quiet location, free breakfast, family friendly. × Cons: few power points in rooms, older decor. → Best for couples and families and those who love the outdoors. » HI Vancouver Jericho Beach Hostel address: 1515 Discovery Street. St Clair Hotel Hostel is a unique, history filled hostel being the first concrete building in Vancouver used as accommodation for railway and sea passengers. Located a very short distance from the seawall and North Vancouver ferry, it’s right in the heart of Vancouver – across from a park, fountains and the Holy Rosary Cathedral. The hostel is right next to Granville Skytrain Station so there’s no need to cart heavy luggage around the city. The renovated dorm and private rooms have their own sink with shared bathroom facilities on each floor. There is a laundry room and free towel hire. The hostel is clean and comfortable – exactly what you need after a busy day exploring in Vancouver. St Clair is where we stayed on their first ever night in Vancouver! I loved the close proximity to the waterfront and Gastown, a safe location for your first time in the city. 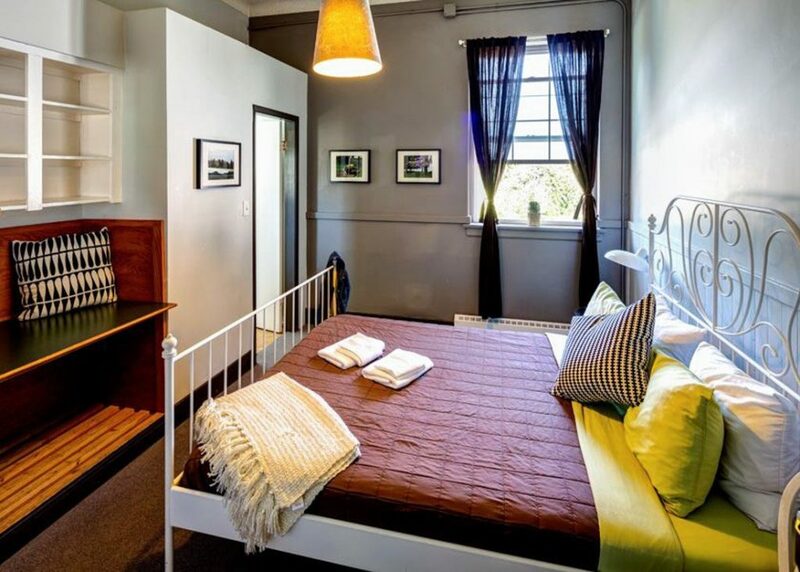 Solo travel fans seem to love St Clair’s Hostel Hostel – ratings of 9.2 for a one person stay on Booking.com. There is a shared lounge and games room, however, the hostel is on the quiet side socially. √ Pros: central location, on-site laundrette. × Cons: no elevator, no air conditioning, very limited kitchen facilities. → Best for solo visitors, friends or couples. 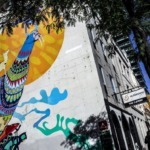 » St Clair Hotel Hostel address: 577 Richards Street. This is a quiet and clean hostel is located a 10-minute walk from the largest Metrotown mall in British Columbia. Burnaby Central Park is a 15-minute walk away. The Skytrain will take you to central Vancouver within 14 minutes and there is free street parking available. 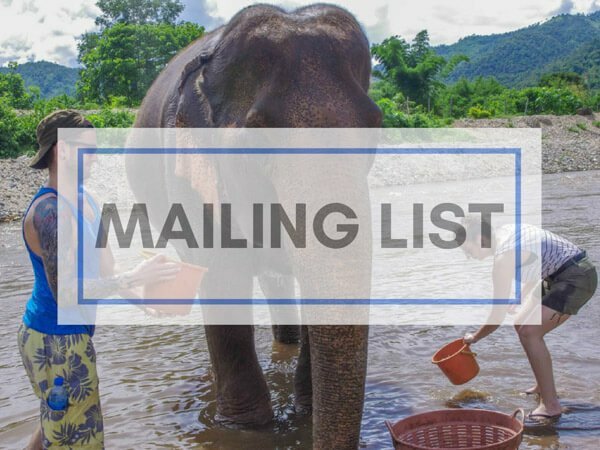 There is the option of working as part of a homestay – free accommodation in exchange for a small amount of housework each day. This is a great incentive in an expensive city! Dorms and private rooms available. There is a kitchen, shared bathroom and dining facility available. We tried to get a homestay position but weren’t lucky. Leave a comment below if you manage to secure a position! √ Pros: quiet location, clean, balcony. × Cons: towels and toilet paper (!) not provided, not suitable for small children or groups of more than six. → Best for couples and backpackers. » Vancouver Backpacker House address: 7020 Gray Avenue. The YWCA Hostel in Vancouver offers guest rooms to visitors as well as local women and children. 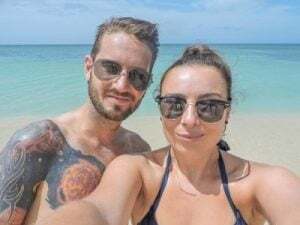 For the conscious travel lover, this is ideal as some of the accommodation cost goes directly to helping local community services. All the rooms are private and there are no dorms available. Bathrooms are a mixture of shared and ensuite. Each bedroom has air conditioning, a mini fridge, desk, cable tv and a telephone. There are three guest area kitchens with a coffee shop on site. This is not your average hostel! Located just off Robson Street and just two blocks from the Stadium Skytrain station, you are close to Vancouver’s tourist attractions – Gastown, Chinatown and Yaletown all nearby to explore. √ Pros: wheelchair accessible, elevator, family friendly. × Cons: thin walls, may be noisy due to construction work taking place until 2020. → Best for: couples and friends. » YWCA Hostel address: 733 Beatty Street. Wondering where to stay in Vancouver while on a tight budget? There is no need to wonder anymore. 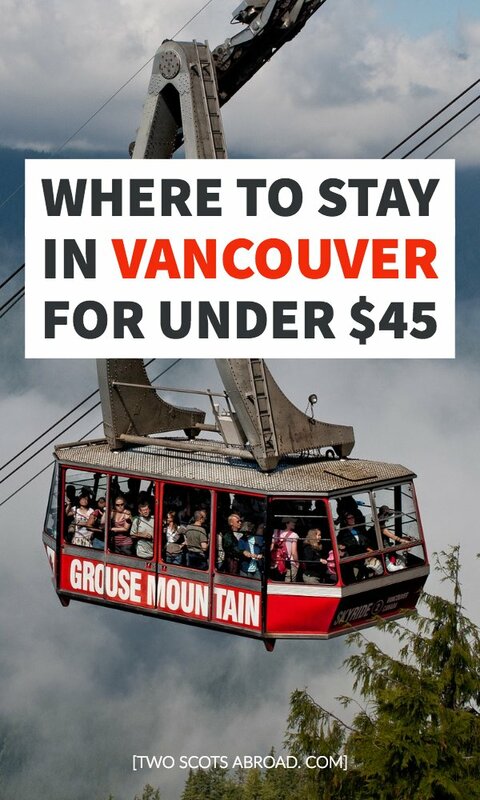 This guide highlights some of the cheap places to stay in Vancouver. 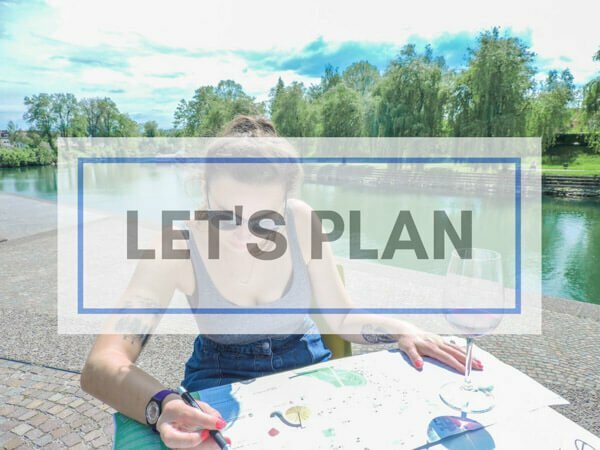 Whether you are looking for a private room or a dorm bed, beach accommodation or party hostel, downtown or scenic views, the choice can be overwhelming but we have researched the best. We can be sure you’ll have a fantastic trip as British Columbia really does have something to offer everyone! Please leave below and I’ll get back to you.